Manchester United's involvement in this season's Champions League remains in the balance after they were held to a goalless draw at home to PSV. 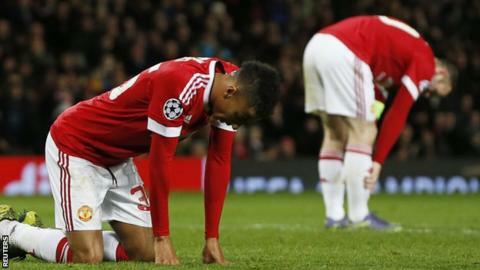 It was a frustrating night for United, who pressed and dominated possession but struggled to hurt their opponents. Jesse Lingard fired their best chance over the bar, while Morgan Schneiderlin saw a close-range shot saved. United will qualify for the last 16 if they beat group leaders Wolfsburg in their final game on 8 December. United knew before Wednesday that a win would be enough to send them through, but the draw leaves them in a very precarious position. They remain in charge of their own fate, with PSV are a point behind them in third, but the Dutch side's final game is at the Philips Stadion against CSKA Moscow, who are already eliminated following a 2-0 home loss to Wolfsburg. The Dutch side also have the advantage of a superior head-to-head record against United, who were beaten 2-1 in the Netherlands in September. High pressing is in vogue in England, thanks largely to Jurgen Klopp's impact at Liverpool, and United employed the tactic during an opening quarter that was full of energy and intent but lacking in end product. A hassled and harried PSV were starved of the ball and pinned back in their own half but rarely in real danger as United failed to find the killer ball, turn of pace or piece of skill to open up a side more than happy to leave Manchester with a well-earned point. In the few times they earned a sight of goal, Lingard's touch let him down in the box, Schneiderlin fluffed a chance from close range from a corner and Anthony Martial fired a shot straight at the keeper from inside the box. As their energy waned, United were even less effective after the break, resulting in aimless balls forward and the inevitable, ineffective introduction of Marouane Fellaini. Lingard's glanced header and shot over the bar after Ashley Young's cross had deflected into his path was the closest they came to a winner. An increasingly comfortable and confident PSV could even have won the game themselves had Santiago Arias found a cross to match the movement and driving run that took him clear down the right. Martial's role in United's attack has been the source of much debate in recent weeks, with many suggesting his pace would be better employed in an outright striking role as opposed to the left of boss Van Gaal's favoured frontman, Wayne Rooney. Having missed Saturday's league win at Watford, Rooney and Martial returned to the starting XI, but with Rooney in a number 10 role behind the centrally-deployed French teenager as part of a four-man attack that also included Memphis Depay and Lingard. Martial had two decent opportunities in the first half, the first when the ball broke to him in the box and the second following a smart turn 15 yards out, but both times he was denied by PSV keeper Jeroen Zoet. He faded into obscurity in the second half, along with the majority of the United side. But he at least lasted the game, unlike Depay, who scored at Watford on Saturday, but was utterly anonymous here and was replaced by Young around the hour mark. Van Gaal will need his attacking quartet to be much sharper in Germany in two weeks time. "I cannot say every game in the interview with you that we didn't finish but it is the truth. On Saturday, Manchester United return to league action with an away trip to leaders Leicester, where they lost 5-3 last season. Match ends, Manchester United 0, PSV Eindhoven 0. Second Half ends, Manchester United 0, PSV Eindhoven 0. Santiago Arias (PSV Eindhoven) is shown the yellow card. Foul by Jeffrey Bruma (PSV Eindhoven). Jeffrey Bruma (PSV Eindhoven) wins a free kick in the defensive half. Substitution, Manchester United. Juan Mata replaces Matteo Darmian. Luuk de Jong (PSV Eindhoven) is shown the yellow card for a bad foul. Corner, PSV Eindhoven. Conceded by Marcos Rojo. Attempt missed. Davy Pröpper (PSV Eindhoven) right footed shot from outside the box is close, but misses to the left. Assisted by Luuk de Jong. Offside, Manchester United. Ashley Young tries a through ball, but Marouane Fellaini is caught offside. Joshua Brenet (PSV Eindhoven) wins a free kick on the left wing. Attempt missed. Jesse Lingard (Manchester United) right footed shot from the centre of the box is too high. Attempt saved. Davy Pröpper (PSV Eindhoven) right footed shot from outside the box is saved in the centre of the goal. Attempt missed. Jürgen Locadia (PSV Eindhoven) left footed shot from outside the box misses to the right. Assisted by Davy Pröpper following a fast break. Corner, Manchester United. Conceded by Gastón Pereiro.